In 1931, Paul Dirac, one of the rock stars of the physics world, made the somewhat startling prediction that “magnetic monopoles,” or particles possessing only a single pole—either north or south—should exist. His conclusion stemmed from examining a famous set of equations that explains the relationship between electricity and magnetism. Maxwell’s equations apply to long-known electric monopole particles, such as negatively charged electrons and positively charged protons; but despite Dirac’s prediction, no one has found magnetic monopole particles. 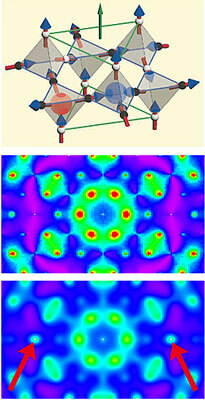 The team created their monopoles in a compound made of oxygen, titanium and dysprosium that, when cooled to nearly absolute zero, forms what scientists call “spin ice.” The material freezes into four-sided crystals (a pyramid with a triangular base) and the magnetic orientation, or “spin,” of the ions at each of the four tips align so that their spins are balanced—two spins point inward and two outward. But using neutron beams at the NCNR, the team found they could knock one of the spins askew so that instead three point in, one out … “creating a monopole, or at least its mathematical equivalent,” Lynn said. Because every crystal pyramid shares its four tips with adjacent pyramids, flipping the spin of one tip creates an “anti-monopole” in the next pyramid over. The team has created monopole-antimonopole pairs repeatedly in a relatively large chunk of the spin ice, allowing them to confirm the monopoles’ existence through advanced imaging techniques such as neutron scattering. ** D. J. P. Morris, et al. Dirac strings and magnetic monopoles in spin ice Dy2Ti2O7. Science, online publication Sept. 3, 2009.